Our Lady Queen of Peace is a Catholic church in Boothbay Harbor, Maine. The foundation of the church was laid in 1916 and completed in 1917 with a belfry and steeple added in 1924. 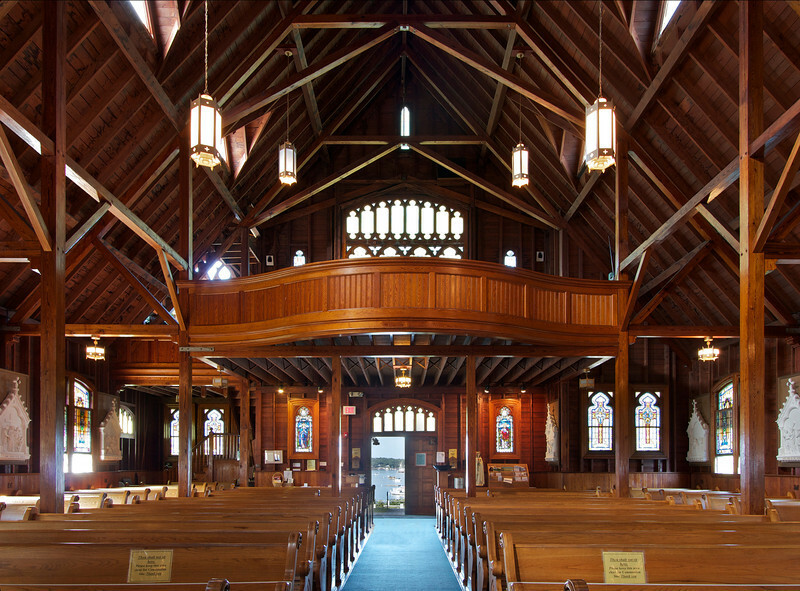 Built to accommodate summer visitors, the church has a seating capacity of 600. In the early years, there was a large summer congregation but only twelve Catholic families in year round residence. A small chapel was built in the basement that met the needs of the small winter congregation, according to the church website. The parish then, as now, covered an area of 30 square miles, including the towns of Southport, Boothbay Harbor, Boothbay, Edgecomb and Wiscasset. In the 1940s, the exterior walls of the church were painted white and floodlights were installed. The building became the most prominent landmark in the region and also a navigation aid at night. The small chapel under the main church was expanded to three times its original size. In 1983 a parcel of land across the street from the church was donated to the Fisherman’s Memorial Committee. The committee cast a bronze fishing dory (small boat) which was dedicated to the memory of the over 229 fishermen from the Boothbay Region who were lost at sea during the last two centuries. At this time Father Lee began the Blessing of the Fishing Fleet after the memorial service that is now an important part of the Annual Fisherman’s Festival every spring according to the church website. In 2009, Our Lady Queen of Peace Parish became part of the new All Saints Parish comprised of St. John the Baptist Church, St. Mary Church, St. Charles Church, St. Ambrose Church, St. Patrick Church, Our Lady Queen of Peace Church, and St. Katharine Drexel Summer Chapel.